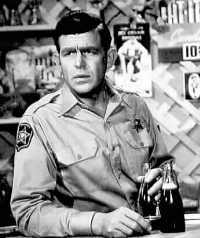 The official on-line chapter of "The Andy Griffith Show" Rerun Watchers Club (TAGSRWC) has become a favorite spot on the internet for TAGS fans. In January 95, WBMUTBB? had a respectable 51 members. As of March '96 the membership has grown to 143 members!! The worldwide web home page had over 1435 visitors in the month of February alone (over 2973 visitors since we began counting). Even though it looks like they may have gone ahead and built that railroad through Mayberry that Seth Taylor worked so hard to prevent, the folks on-line havent forgotten what Mayberry is all about. Things are still taken easy and slow. Even with all the electronial mail, folks take the time to get to know one another by sending notes to everybody telling about themselves. We dont have very many strangers in our town. No sir, we like to spend time with our friends and thats just what we do. So, if you have a chance to, drop by and say howdy. Goobers down at the courthouse answering the phone and Floyd has the keys so he can let Otis in if he drops by for a visit. Just remember, whether its by paper writing or by electronial writing, Mayberry is always our home town and never changes. Things dont always turn out as planned. I think that Joel and Whitney Laird (of the Aunt Bee Haven chapter) would agree with that statement 100%. Who would have thought that northeast Alabama would be affected by a hurricane? Well, hurricane Opal showed everybody when it tore through Oxford, AL the Wednesday night before OxfordFest was to begin. Power out, trees down...it was a sight! Events scheduled for Thursday night had to be canceled and all there was to do was sit around and do nothing. Wait a minute! Sitting around! Isnt that what folks in Mayberry do best; Sitting around and visiting with one another, eating cashew fudge or playing checkers? Why yes, yes it is. And thats exactly what happened that night. Six of the 11 cast members scheduled to appear that weekend at OxfordFest were already in town and with the performance for that evening canceled, what could we do but have dinner? And so we did. After all, Aunt Bee (Haven) would expect no less than to feed these ambassadors from Mayberry, NC. 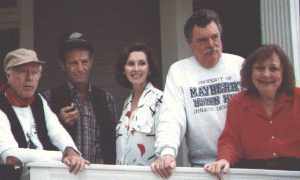 Jean Carson (not pictured), Howard Morris, Mitch Jayne, Elinor Donahue, Bernard Fox and Betty Lynn were joined for dinner by David "Mayberry Deputy" Browning, Joel, Jan (Mrs. Floyd), and me (Allan, a.k.a. Floyd). Like a fly on the wall at Mrs. Wileys, I sat and listened to our Mayberry friends talk about whatever came to mind. Much of the talk was about the storm but the subject drifted often with stories about one another being a favorite point of discussion. I was sitting across the table from Elinor and I noticed as she continued to look in my direction. After several minutes of this, she pushed her chair back and announced, "I just cant take it" and walked from the table. My mind raced to think of what I might have done to cause this reaction when I noticed that she had walked around the table and behind me. I looked to see that she was making adjustments to a picture hanging on the wall while calling back to Howard saying, "Is it straight?" There was laughter at the sight of "Miss Ellie" being herself and needing to straighten that picture. The evening went on and news of people that had traveled from distant locations to see our Mayberry friends reached the ears of the cast. They discussed the situation and said they would be glad to meet these travelers on the porch of the hotel after dinner. Our friends signed autographs, posed for pictures, and talked with all those that braved the night to see them. The night didnt turn out as it had been planned but it truly was a special night in Mayberry, for me. Q. My foot often falls asleep. Should I be concerned? A. Probably not. Now and then everyone experiences numbness or tingling in a foot or other body part that has "fallen asleep." Normal feeling usually returns quickly. However, tingling or numbness that persists could indicate a potentially serious nerve or circulatory problem. If you experience persistent tingling or numbness in any body part, call your doctor right away. Lately, we have been experiencing a rash of nose bleeds resulting from punches or other blows to the nose. Unfortunately, many people rely on outdated or useless remedies to help stop their nose from bleeding. Sit or stand so your head is higher than your heart. Pinch your nose between the bridge and nostrils (the soft parts of the nose) with your thumb and index finger. Do not hold your head back or lie down. Although ice can help stop swelling if the nosebleed is caused by a blow to the nose, it cannot stop the bleeding. But most of all, avoid being punched in the nose.